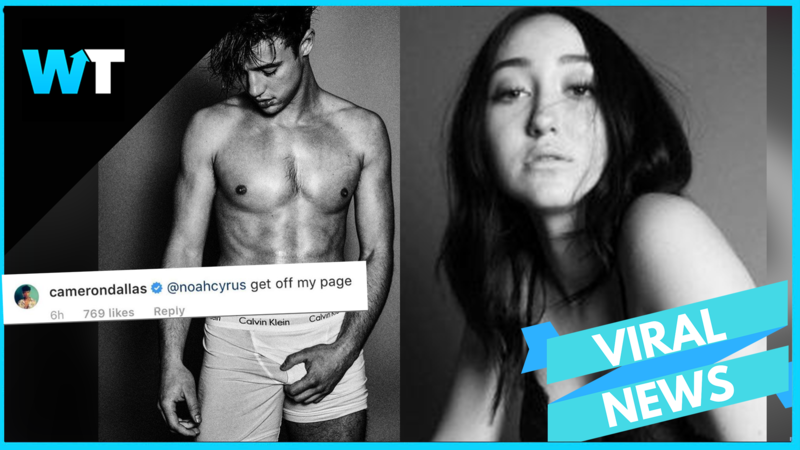 VIDEO: Cameron Dallas CLAPS BACK at Noah Cyrus? Cameron Dallas and Noah Cyrus are raising eyebrows on social media, sparking (unconfirmed) rumors that they might be working together on new music. Cameron Dallas and Noah Cyrus are raising eyebrows on social media sparking (unconfirmed) rumors that they might be working together on new music. His modeling career with Calvin Klein also seems to be going well, but in January, Cameron made headlines when he was taken into custody on New Years Eve around 5am at a hotel in Aspen, Colorado, after punching another man in the face breaking his nose. Meanwhile, Cameron has been carrying on, promoting his music and posting his latest pics in his Calvins, on which Noah Cyrus made a comment that got a lot of attention. But others pointed out that the two are friends and they were just joking around. In fact, as both are in the music scene, some speculate they might be working on music together. Take a listen to these two samples. And here’s Cameron’s sample of his new song again: But obviously, this is all just speculation and the two have not confirmed they they are working together yet. But what do you think? Was Noah being salty or just joking? And do you think they’re collabing? Let us know in the comments or on Twitter at @WhatsTrending.